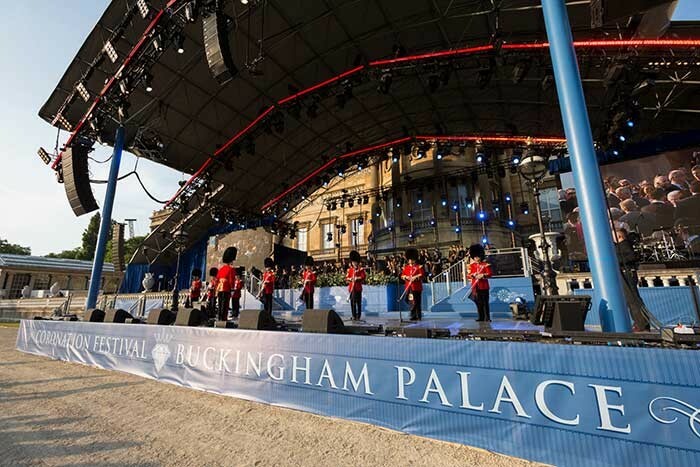 RG Jones’ busy summer season with Martin Audio premier PA systems continued in July, with the Coronation Festival at Buckingham Palace. This followed the Glastonbury Festival, held a few weeks previously, with the simultaneous Henley Festival also placing further demands on their Martin Audio inventory. 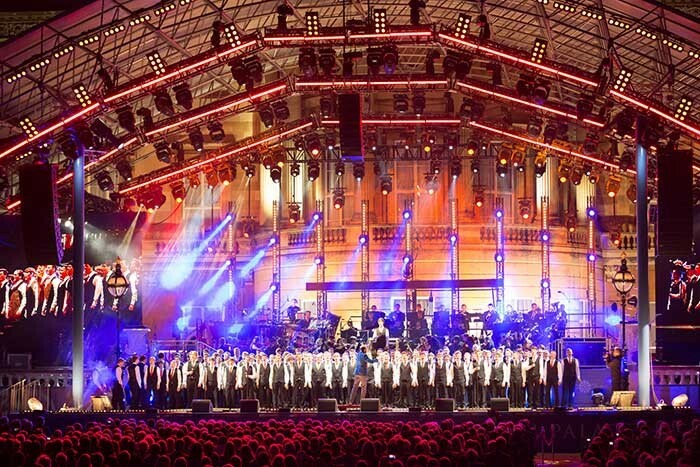 Such congestion with very different environments was always going to be a challenge, but with careful planning and deployment, the Coronation Festival proved once again that RG Jones and Martin Audio were capable of uniting the audience experience. The audio specialists had been sub-contracted by main technical production company, Hawthorns — who were in turn introduced to the project by event organiser, Media 10. Both the Coronation Festival and exhibition were hosted by the Royal Warrant Holders Association in the Gardens of Buckingham Palace. RG Jones, themselves Royal Warrant Holders, participated in the exhibition (along with more than 200 others) while simultaneously providing sound reinforcement for the Gala concerts. In fact the RG Jones stand exhibited an original Morris J-type — the same as the one used by the original founder Ronald Geoffrey Jones back in the 1920’s. As with Glastonbury, RG Jones’ project manager, Ben Milton relished in the challenge of project managing a large-scale event — but unlike Glastonbury, where Martin Audio’s W8L Longbow system was deployed, he said the system of choice this time was the company’s W8LC and W8LM systems. 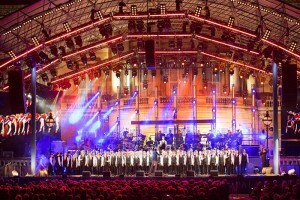 And with a wide range of artists celebrating 60 years of the performing arts — including Dame Kiri Te Kanawa, Katie Melua, Russell Watson, Katherine Jenkins, Laura Wright, Only Boys Allowed, The Feeling — as well as the National Youth Orchestra and Matthew Bourne's New Adventures — it created quite a line congestion for Milton and Simon Honywill at the FOH mixing desk. “I love the challenge of having 250-plus inputs on the desk with multiple acts,” said the former, explaining that this included active splits from the stage, sent to the BBC broadcast OB trucks. Out on each wing, in front of the Palace terrace, two hangs of 14 x Martin Audio W8LC elements were mounted on smart PA masts. A further three centre in-hangs formed the thrust canopy PA. This comprised six W8LM Mini line arrays (with two W8LMD Downfills at the base), flanked by two hangs of eight W8LC to produce an L/C/R image. Under the thrust stage four gauze-covered WLX subs were stationed, with a further six ground stacked WLX under the two speaker masts (three per side). Finally, eight Martin Audio DD6 Differential Dispersion horns were positioned along the front lip as close fills. All processing was carried out in an XTA Audiocore environment, with system technician Mark Edwards EQing and time aligning the system remotely via a wireless tablet. Said Ben Milton, “The in-hangs had to do all the work and we had to deal with timing issues between the wide hangs and the inner hangs. The LC’s worked fantastically well and provided full 100 metre coverage without delays for 20,000 people. “In fact when you sat in the middle of the auditorium it was just like a cinematic setting carefully time aligned to get the stereo image — and wherever you went it delivered and it was still high fidelity sound.” The audio complemented the width of the stage, he said, adding that both Tim Davies [BBC Television sound supervisor] and the orchestra had expressed their delight with the sound. Supporting system designer Ben Milton, FOH engineer Simon Honywill and system technician, Mark Edwards, James Breward (system/comms) and on stage, Mark Isbister (patchmaster), Alison Dale (RF and orchestral micing), Damon Dyer (monitors) and Ian Threlfall (stage).